inmate dgarretson can answer this query for you. You can find his comments in my Thiel Speakers thread. I own the CS 2.4SE and the improvements that one can expect is the use of top film capacitors on the x-over. Happy Listening! Thanks Jafant. I believe the only difference between the 2.4 and 2.4SE model was the use of ClarityCap SA capacitors. I don't have a schematic, but during that time Thiel was purchasing 14uf and 28uf values. They may have been bypassing these with 1uf polystyrene caps. You should be able to confirm this by inspecting the crossover. Since then we have surpassed SA by two generations-- ESA and now CSA. For that application I suggest CSA/250V or, space permitting, our top CMR/400V model. Alternatively, i buy 2 units CSA/250 or CMR/400v of value 14uf and 28uf to replace the existing two caps w value 1uf. You should inspect the board to be sure. The configuration is likely 14uf in parallel with 1uf(=15uf) and 28uf in parallel with 1uf(=29uf). If this is the case, then you could (1) replace the 14uf and 28uf values and leave the stock 1uf polystryrene caps in place, or (2) replace both the high values and the paralleled 1uf caps with 15uf and 29uf. It is advisable to look carefully at the circuit before ordering anything. Noted with thanks. I shall check over this one or two weekends. I will post again shall i need futher assistance. Thank you do much for your wonderfull and useful advice. additionally, the "SE" speaker is a solid maple cabinet w/ a special red Vermillion stain unique to this model. Much Thanks for your assistance- dgarretson. Agreed. SE looks glamour. I like its finishing in particular. It is a great speaker but need power to optimise its performance. Not so much high power, more importantly high -current! keep me posted on your cross-over project. Happy Listening! Sure. But it may take same time as currently i m required to travel more often to solicit more new biz in view of global economy slowdown. Not easy in banking industry now. Dear friends, i tried to kick start my caps upgrading project but unsuccessful. 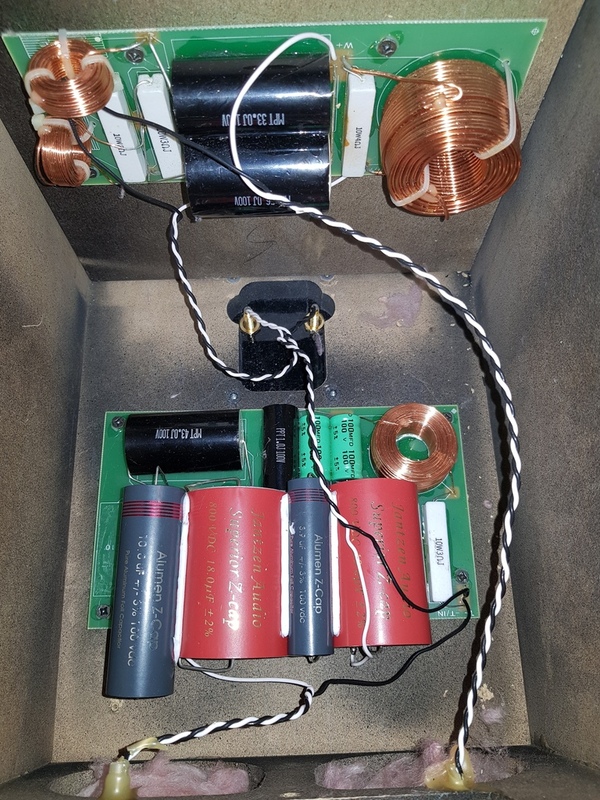 In parcular, i have removed the screws at the bottom of thiel speakers but can not open the enclosure. May i know anybody can enlighten me on how to dismantle the speakers to gain access to the crossover? I am unable to find these values in single caps from Clarity or Mundorf, altho' you can achieve the same capacitance with, for example, a 12 and 2uF cap. Rob Gillum at Coherent Source Service has SE upgrade kits so that you can transform you CS2.4's performance. Presumably these include the full-value caps seen in the linked pic. He also has the SE outriggers with SS spikes. Please support Coherent Source Service! I have a pair of SE version, so already with the Clarity SA caps. I might upgrade those to a newer version (eg, Clarity CSA) but will probably upgrade the caps in the woofer feed first. From the schematic supplied by Rob Gillum, it appears there is a 33uF cap in the direct feed. Again, I can't find that exact value in a single cap so will have to get there using a combination. Rob Gillum wrote me that the CS2.4's bottom panel is glued on. Access to the crossovers is via the passive radiator. I am leery of removing these for fear of difficulty in reattaching them but Rob wrote that you can grasp the radiator by its surround while re-screwing. I will report back as I upgrade my Thiels (won't be anytime soon). What are the differences you're hearing? Yes, please share a description of sonic improvement. Nice work, though. And thanks for the pic. I suggest replacing the resistors, too. I upgraded my sandcast OEMs to Mills MRA 12s. A nice sonic improvement at low cost ($100). My resistors showed signs of overheating, so it’s possible my old ones were damaged more so than the Mills being better? Yours appear clean. Still, a cost effective upgrade. With Tom Thiel’s tutelage, I will soon be completely rebuilding my boards, even replacing the coils. Everything will be new from the binding posts to the XO output wire (other than I will recycle the Mills resistors). I will post my progress and impressions on the Thiel owners thread. Thanks for the pictures and upgrade info. I am seriously planning to do the upgrade, but if I screw up removing the passive radiator, it's a one way street. I would advise if you would go to the trouble doing the upgrade, I would recommend using at least Mundorf Supreme or Jantzen high end caps. It's very interesting to me that most high end speakers, even those that cost 20K or more, the xover components are not very high end. Good caps and resistors really make a difference. After much research and consideration, Tom Thiel has settled on Clarity CSAs for the upgrade. He even has a custom low voltage version to replace the electrolytics. I am going to also try Multicap RTX bypasses (1%) on the coax board. Progress on my 2.4s has been slower than envisioned last spring but I hope to have one channel done by the end of the month. The passive radiator is hardier than it looks, but not easy to get the proper angle for removal. Pretty snug in there. The (still growing) improvements ain't small to say the least!! Knowing me, in the end I will probably upgrade the whole crossover, but the big one will be for sure the capacitors I just did!! if you are still around- give me an update? Happy Listening! Very cool and interesting project. Good to read about another CS 2.4 loudspeaker owner. Please feel free to join us over on the Thiel Owners thread here at Audiogon. Happy Listening! After much research and consideration, Tom Thiel has settled on Clarity CSAs for the upgrade. I think the decision probably comes down to cost/performance ratio. If you were to do the upgrading yourself, I would highly recommend something like Mundorf Supreme or some of Jantzen high end caps. He even has a custom low voltage version to replace the electrolytics. My guess is the electrolytics caps are in the shunt signal path so it may not be critical. Also, they tend to be of very high value (like 50uf or 100uf higher). So it may be expensive to replace them with poly cap. For example, a 100uf Clarity CSA cap is about $100 dollars. I have not seen the xover in person myself (though hopefully soon), but does anyone know which one is in series and which is in shunt? The caps in series make a lot more difference in sound quality. It may not be worth it to upgrade the one in shunt since the improvement is minimal. The picture of the xover seems to show the binding posts are at the bottom of the cabinet. As far as I know, all Thiel CS2.4s have the binding posts at the back of the cabinet. @andy2 holco has uploaded the schematic. The 14 and 28 uf caps are in the feed. Note the SE version gets full values in single caps whereas the original added 1uf bypasses (ie, 13+1=14). The 43 is a subfeed. Those big ELs are in the shunt position, so they probably make less audible difference but might still offer a sonic improvement with an upgrade. Even if not, it’s worth replacing older ELs. The decision to go with CSAs is partly a choice of price. I mean, does it make sense to put $8000 worth of Dueland caps in a speaker that retailed for $4000? Mundorfs and many others were considered. Tom and I spent many weeks researching and we each spoke with several people with good knowledge before landing on the CSAs. I was pushing for the top of the Clarity line CMRs but Tom got some good info that the CSAs, possibly with small Multicap bypasses, would hit the sweet spot and for much less money. Toms decisions are very well considered and one of the considerations was price. At the end of the day, Tom wants to not stray too far from the Thiel tenet of value while still providing a very worthwhile upgrade. Might you eke out even better performance with Dueland and such? Maybe! Let us know whatever you try. Thank you beetlemania. Your insights are very helpful. I was looking to get to work on it next week, but since my handy skills are that of a caveman, I am not sure I can have it finished any time soon. But I will post my upgrade results once everything is finished. I will probably go with Mundorf MCap Supreme since I’ve had very good results with some of my works. It’s sort of my go to caps. They may be somewhat expensive but definitely worth the price. Also if anyone has any more picture of the xover, it would be very helpful. Don't know iff it's old news but I share it anyway. I gave heavy consideration to the Mcap supreme. It’s said to be quite good. One reason I’m going with Clarity is that Jim Thiel et al. did many comparisons when picking caps for the SE version. I don’t know if they tried Mundorfs but probably. They chose the Clarity SA as the best and that cap has been upgraded by two generations now. A company has to take many things into consideration, for me as an end user only one thing counts, maximum quality. I used the older Clarity SA caps in the past, but apparently there is a newer type (CSA) that they claim to have the "CopperConnect" technology. This supposedly improves the sound over the previous version. For those who would like to try Mundorf supreme cap but has been deterred by the high cost, you can do 50% mundorf and 50% clarity which would be more cost effective but still have very good sound. I always wonder how he had time to go over all of those caps. Reading his reviews is a humbling experience. Sorry guys, busy lately as i need to travel extensively due to job requirement. I therefore have to postpone my project to next year. Holco, can you advise how to gain access to the crossover? I can not find any opening from the bottom of the speaker. I tried to gain acess via the radiator but unsucessful. After removing the screws of the radiator, the radiator still stuck to the speaker box enclosure. It looks like it was glued to the enclosure. I dare not force open it worrying it may damage it. Your advice is highly appreciated. I would add two things, 1) be patient rotating the radiator to get the right angle for removal; 2) you don’t need to be overly paranoid grasping the radiator surrounds as I was initially. Not nearly as delicate as I first imagined, albeit still need to exercise care. beetlemania posted are the correct way to get acces to the crossovers, the radiator was also a bit sticky on my loudspeakers, but with a calm forge thru one of the holes they game loose. Thank you for the wonderful advice. Sorry to ask one more question. May i know how to remove the crossover module from the speaker box and how to stick it back after the modification? I intend to give thiel 2. 4 a new heart by replacing the existing capacitors for the wofer w new original thiel capacitors to preserve its original sound. May i know what is the brand of the capacitor that used by thiel? From the photos that you attached i can not view its brand. Your advice is highly appreciated. Tq. Replace with the same? Why? The only ones that will wear out are the electrolytics in the coax shunt position. In my SEs, these are CYC and those might be the last I would use in an upgrade. Erse has an affordable 100 uF metal polypropylene. And if you’re gonna to replace anything else, might as well put in something of higher quality than the OEM caps. Jim Thiel used Clarity SAs in the coax feeds and Tom Thiel is planning to use Clarity CSA (2 generations newer than SA) for most caps in his 2.4 beta upgrade. More info on the Thiel Owners thread. Please pardon my ignorance. I thought it will lose its capacitance overtime. That is why i came out an idea to replace the old for new. For changing to different brand of the capacitors, my worry is it will change the original character of the speaker. Electrolytic caps (those 100 uF in a Thiel) will drift after, say, 15-20 years. But everything else should be good for even longer. As far as changing the character, yes, you can make the speaker sound even better by upgrading the quality of the passive parts. The OEM caps and resistors are far from top quality available, especially today. Thiels were built to a price point so that regilar people could afford them. They are really good but can be made even better by improving parts quality in the crossovers. Go read the Thiel Owners thread starting about February when Tom Thiel started posting. I will take your advice to scrutinize the thread suggested by you. Hi guys, i intend to get claritycap csa 10 ohm + 3.9ohm to replace the original caps 13ohm +1ohm and claritycap csa 10ohm +18ohm to replace 27ohm + 1ohm original caps. Do i need to change or remove any resistors? Any opion on this combination? Hi guys, i intend to get claritycap csa 10 ohm + 3.9ohm to replace the original caps 13ohm +1ohm and claritycap csa 10ohm +18ohm to replace 27ohm + 1ohm original caps. Do i need to change or remove any resistors? I think you mean 10uF+3.9uF and 10uF+18uF, that should be fine and you don't need to change any resistor unless you want to upgrade the resistors to higher quality. I look forward in seeing your presence over on the Thiel Owners thread. As luck will have it, the Gentlemen are working progressively on this very subject. Stay tuned. in particular - follow Beetlemania, Holco and TomThiel for answers to your initial query. Happy Listening! Your Clarity Cap plan sounds good. You can save money and space by going with the 250 V version for the larger capacitance value (ie, 10 and 18 uF) and 630 V version for the smaller value (3.9 and 10). Another path to 28 uF is to get 25 + 3. Madisound has the CSA 250 in 25 uF and I think Partsconnexion has the 630 V version of 3 uF. You might also get add a small bypass to each, say 0.1 uF. I’m going to try Multicap RTX at ~1% but Cornell-Dubilier is a worthy contender, among others. You might also upgrade the 43 uF cap which is a subfeed. That cap is downstream from the 16 ohm resistor so you can go with a lower voltage. Until I started working with Tom Thiel, I considered a 39 uF ERSE Pulse X (100 V?) + 3.9 uF CSA250V. Finally, those 100 uF electrolytics should optimally be replaced with MPT-type capacitors. Again, ERSE PulseX is a worthy contender but you might have trouble fitting those on your boards. At the least, I suggest replacing the electrolytics with fresh ones (see Tom Thiel’s recent post on the Thiel Owner’s thread). While you’re in there, I highly recommend replacing all resistors with Mills (or Vishay-Mills) MRA-12s. Sonic Craft has all the CS2.4 values although you have to mix and match the old (Mills) and new (Vishay-Mills). Only about $100 for all and makes a worthwhile improvement in SQ. Thank you guys for all the valuable information. I have just ordered the claritycap csa combinations i suggested earlier. I'm no expert in this area therefore decided to only upgrade a few caps at this juncture. I hope i can complete the project in dec or jan and share its result with all of you thereafter. Excellent! I am looking forward to the outcome of your cap-replacement project. Happy Listening! I just realised that there are two versions of claritycap csa i.e 250v and 630v. I have ordered 250v version. Is there any concerned and or any sonic difference? From the thiel owner thread, you have changed all the ceramics resistors to Mills resistors and gained vast improvement. Nevertheless, I noticed all the original ceramic resistors are rated 10w but Mills MRA12 are rated 12w. Is there any particular reasons that you changed the spec?